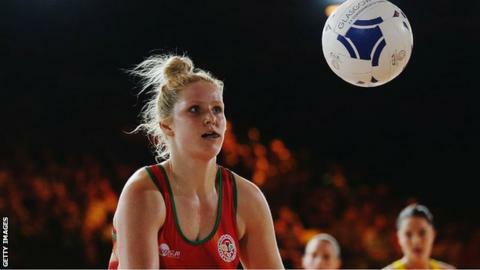 Wales's top netballers began their new campaign with a double target in 2015. The aim is for the Celtic Dragons to reach the knockout stages of the new Superleague campaign and for the national side to make ground up the rankings in the World Cup in Sydney. They do so under new management, with Trish Wilcox taking over as permanent coach following the departure of Melissa Hyndman, and with ex-WRU man Alun Davies as the new chief executive of Welsh Netball. "We're looking for semi-final and then final positions," captain Suzy Drane told BBC Wales. "We've got a new management and we've done the hard work in training." Celtic Dragons' season opener did not go according to plan as they went down 54-39 against Hertfordshire Mavericks at Cardiff's House of Sport on Saturday. But the Dragons can quickly turn that result around as they move across the city to tackle Northumbria in a televised fixture at the Sport Wales National Centre on Monday. Wilcox returns home after half a lifetime spent in the netball hotbed of New Zealand, working to develop the game in the Auckland area with spells in charge of the Cook Islands national side and Samoa Under-21. "It's a lovely opportunity to come back to the country I was born in and it's been really great reconnecting with my large family in south-west Wales," explains Wilcox. "We've had to look at a different style of game but it's a young squad and that's exciting for the future potential of Wales." "I was 21 years working in New Zealand with massive opportunities in coaching and personal development there, and it's a really cool thing to bring that learning back home." But she knows the sport does not enjoy the same profile or finances in Britain. "There's far more resources over there, it's a high priority sport, so one of the challenges here is accessing funding and people," she said. "But if you've got a group of passionate supporters and volunteers you can achieve anything." Last season the Dragons finished fifth in the eight-team Superleague, failing to match their performance of the 2013 season when they narrowly lost to Team Bath in the final. "We've got a fresh outlook with a new-look team and I'm very excited for the new season, it's been a long time coming," said captain Drane. "We love our Green Army (of supporters) and we're excited to play at different venues (including Deeside in north Wales). The message we want to send out is please make sure you come along, we'd love to see sell-out crowds." But 6ft 6in goal-shooter Lottysha Cato has departed for Yorkshire Jets, leaving the Dragons with an all-Welsh squad and 6ft 2in Chelsea Lewis set to take over as the main target up front after a season in New Zealand. "We've had to look at a different style of game but it's a young squad and that's exciting for the future potential of Wales," added Wilcox. The national team face another major tournament after qualifying for the World Cup Down Under in August, having finished eighth at the Commonwealth Games in Glasgow. And defender Nia Jones hopes the Dragons, who provide the bulk of the Wales line-up, will show more consistency in the build-up. "Last season we had a lot of highs and lows, we lost to Northumbria in a game we should have won, but we came from 12 goals down to beat Yorkshire Jets and we beat Bath on the final day of the season," Jones said. "You know you're going to get an entertaining match with us, but we need more consistency."